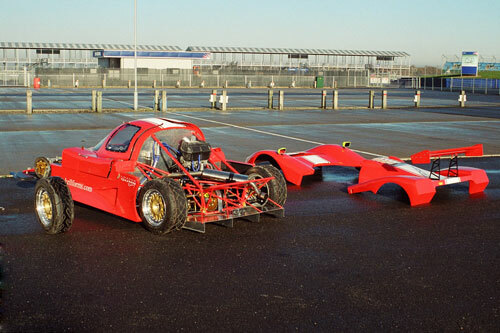 Well known and highly respected Gary Gunn of Loaded Gunn Racing was commissioned on behalf of Kellforms Woodmasters Ltd at the end of January 2005 to design, manufacture and develop a prototype 2 seater chassis and running gear to suit the dimensions of the Kellforms Retoga body shape. 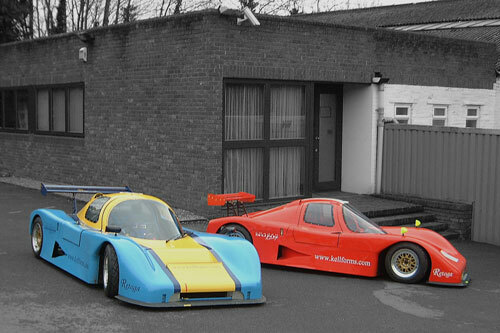 The Retoga kit car captures the classic Le Mans styling of the 80´s with its´ fantastic enclosed cockpit style. Not only does it look the part, it performs too. The chassis compromises of a light weight round tubular space frame, tig welded and gusseted for extra support. Loaded Gunn designed upper and lower wishbones, uprights with AP disc's and calipers all round. All bespoke components are CNC machined from highest quality materials at our High Wycombe facility to tolerances of ±0.02mm. 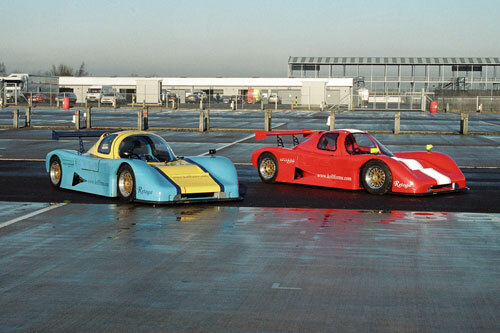 Currently the works cars consist of the original Retoga, powered by a Yamaha R1 engine coupled to a Quaife / Powertec gearbox & drive train, and the "OrangeBoom" with a Ford Zetec / Sigma 1.6ltr engine coupled to an Elite 5 speed sequential transaxle. Other included features are adjustable pedals and steering to accommodate different height drivers, quick release steering wheel, electronic dash display with shift lights, adjustable rear wing, front and rear venturies for ground affect and of course the striking Retoga body shape. Kellforms Woodmasters is a long established company having been associated with the automobile industry for forty plus years, including twenty years providing a total engineering package to Aston Martin Lagonda, from original design concept to final assembly facilities.